If you’ve come across my Instagram account or read my thoughts on makeup and minimalism, then you already have an idea of what this is about. In an effort to continue writing about makeup without having to spend lots on new products, I decided to make use of what I already own, but I didn’t want to just make reviews. So this is what I came up with. I’ve always been a fan of products that you can get a lot of use of, like the Revlon Highlighting Palette. I was curious to know, though, if there was something else in my stash that could give me more bang for my buck. That’s where the LA Girl Cosmetics High Definition Color palette in Harmony came in. When I swatched the product at the mall, I was smitten. The colors were neutral, they glided easily upon making swatches, and the pigmentation was good. When I went home to try it, however, the product transferred poorly. I felt like I was conned by the mall’s lighting. And then I realized the palette has a waxy top that I needed to scrape off before I can use it properly. After that, I already started experimenting. Here are some of the looks I created with the palette. I’m still trying to master how to put eyeshadow on my hooded lids, so these are amateurish — especially this one. This is something I would wear daily. I just swiped the pinkish cream on my mobile lid and put the brightest orange on my crease. For this look, I tried to mimic what my uncle did on my eyes for my third-year prom. I just put the darkest shade in the palette on my crease, as well as on the inner and outer corner of my eyes. In the middle, I used the white shade. This is my take on the cut-crease style. The process is similar to that of the halo, except I didn’t put the dark shade on the inner and outer corners of my eyes, and I put a gold shadow on my mobile lid and took it a tad closer to my crease color. This look was inspired by the colors of the sunset. The gold color on my lower lash line should have been on my inner corner or somewhere along my crease, though. But I really like how this looks. There were some colors that I did not get to play with, so I’m looking forward to learning whether this palette can help me make more than five looks. Some of the colors — especially the gold and orange-toned ones — are very similar, though, so we’ll see. 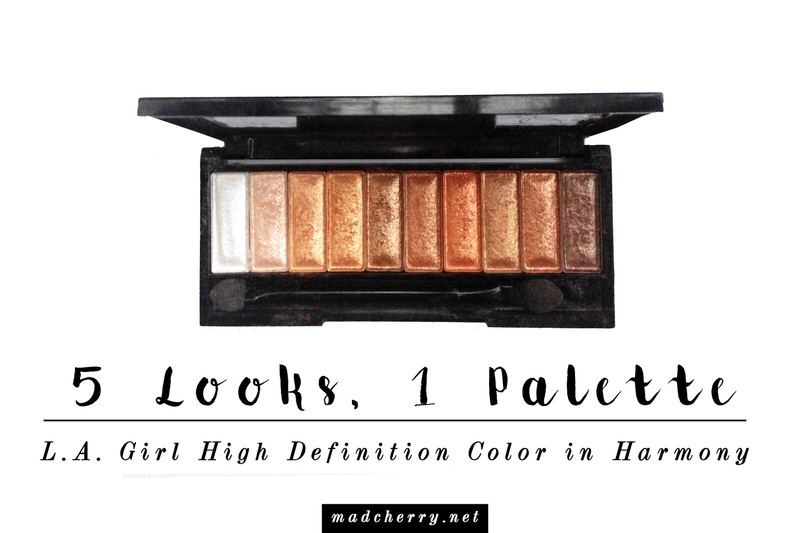 Have you tried this palette before? What palette should I try out next? Jorj writes and helps shape stories that stick in people's minds, tug at their heartstrings and move them to action. She spends her free time trying to read the whole Internet. Get first dibs on exclusive content by signing up below!